The society's most important event of the year is our Gem and Mineral Show 'LITHORAMA' held in November at the 'BARN' in Livermore. Every year the Lithophiles present a scholarship to a Geology Student from California State University, East Bay. This scholarship is in the form of a 'Brunton' Transit which the students use in their Field Geology Class. 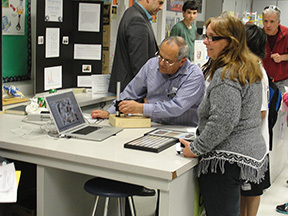 For many years the society has had an educational and information booth at 'Science Odyssey' the Livermore Schools Science Fair. 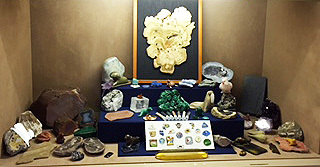 Rocks and Minerals and Fossils to local school children, scout groups and home-schooled children. 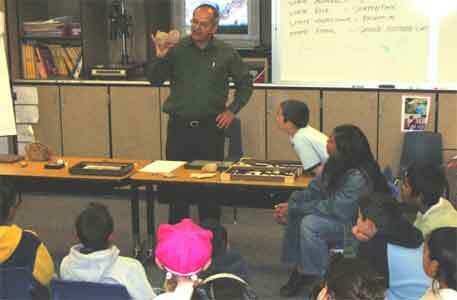 This project has given more than 1100 students a chance to see and enjoy Fossils and Minerals each year. Lithophiles Display at 2015 Alameda Co. Fair. We Got a First Prize for this years entry. 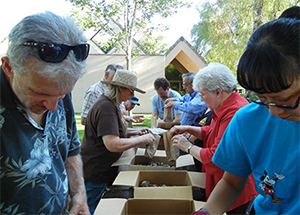 Lithophiles making Grab Bags with Rocks and Minerals. We usually have a club picnic in place of our August meeting. In December we have a club Christmas Party along with our regular meeting.